The holidays are right around the corner, and Thanksgiving planning is in full swing! Have you looked at the prices on table linens lately? If you haven’t, let’s just say they aren’t cheap. 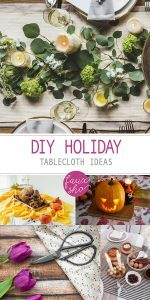 So before you go and try to buy a reasonably priced holiday tablecloth, check out the following DIY holiday tablecloth ideas. 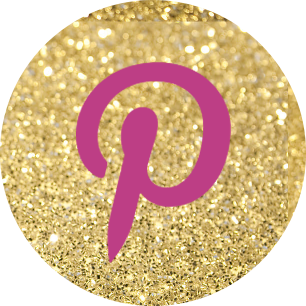 They won’t disappoint you or your guests, and they’ll probably save you some cash. 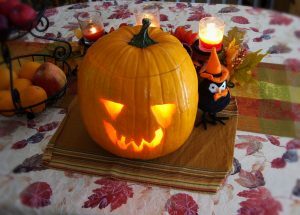 For a fun Halloween and Thanksgiving-appropriate tablecloth, visit your local fabric store or check out Fabric.com. Choose a fabric with a fall leaf pattern like the one pictured and sew your own tablecloth. I’ve done this, and 10 years later I still use that tablecloth every Thanksgiving! Before you buy, measure the table you want to cover so you’ll be sure to buy enough. For a round table, measure the diameter of the table, plus a 6″ drop for the sides. Add another 2″ for the hem. For a square or rectangular table, measure the area, plus a 6″ drop for all sides and a 2″ hem allowance. If you will need to sew panels together to cover the area of the table, allow another 1″ for seam allowances. 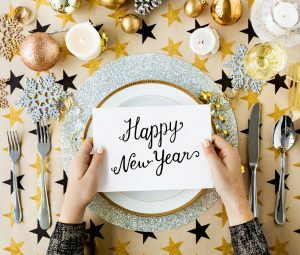 If you own plenty of white tablecloths, it isn’t hard to jazz them up for whatever holiday you’re celebrating. A smaller, colored round or square tablecloth is an easy way to dress up a plain white tablecloth. 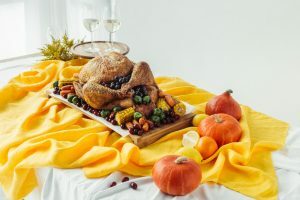 I love the look of this bright yellow tablecloth on a Thanksgiving table. Don’t be afraid to choose an unexpected color of fabric for your DIY holiday tablecloth. 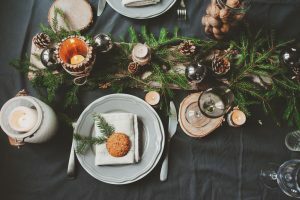 A charcoal-colored tablecloth is so pretty paired up with wood slice coasters, evergreens, and pine cones. 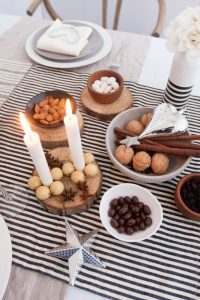 It’s a lovely DIY holiday tablecloth idea! 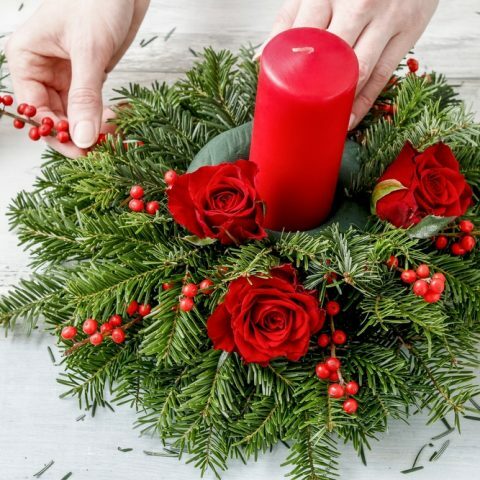 Decorate your own DIY holiday “tablecloth” by starting with a blank canvas of white paper. Lay the paper out on the table and then use stamps or Sharpies to decorate it. The best part about this idea is that it’s completely disposable and requires no laundering. And next year, you can do something completely different. A popular DIY holiday tablecloth idea is to use wrapping paper for either the tablecloth or as a table runner over a white tablecloth. 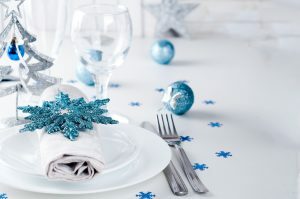 Choose an appealing design and then let that design inspire the rest of your holiday tablescape. Once again, it’s disposable and you can do something else next year! Have fun with your DIY holiday tablecloth. Let us know what you come up with!